I have been going the natural way for beauty for quiet sometime now. I started using oils for my face but then gave up on them as my skin couldn't take it in summers. Now that winter is here and my skin is back to being its dry and flaky self Iam back to using oils on my face. Today Iam going to talk about castor oil which is beneficial for skin and hair but I personally havent tried it on my face yet. On my hair however castor oil works like a charm. Castor oil is also used to grow eye lashes, brows and fade stretch marks. Castor oil has abundant benefits when it comes to haircare. It promotes healthy hair growth, keeps split ends at bay, conditions and adds shine to your hair and also prevents premature graying. If you want to include Castor oil in your hair care routine then you have to make sure you use good quality oil from a reputed brand. There are many brands selling castor oil but for maximum benefits make sure to choose an oil which is organic and pure. 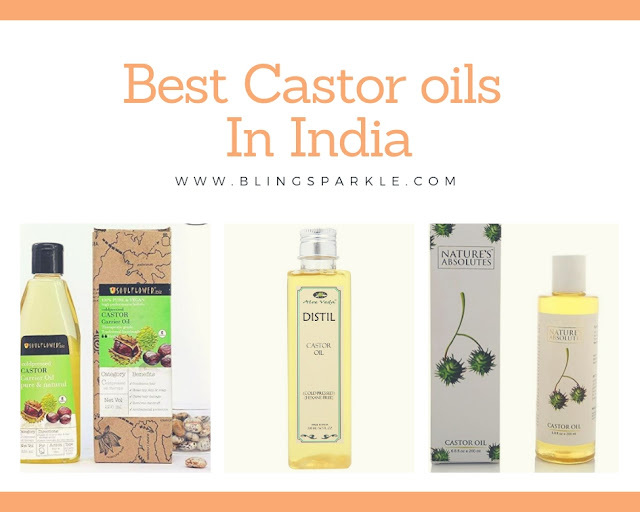 Here in This post I bring to you 10 best castor oil in India with price. But before that lets find out a little about castor oil. Castor oil is pale yellow oil extracted from Castor beans (Ricinus Communis) which is native to tropical areas of Africa and Asia. This oil is rich in antioxidants and has anti-inflammatory, antimicrobial, moisturizing properties. Thick and sticky castor oil is a natural beauty remedy which can be used to treat hair and skin problems. Medically also castor oil has many benefits especially in treating digestive issues. There are many kinds of castor oils available but the best kind you should use for skin care and hair care are Cold pressed castor oil and Jamaican black castor oil. In India cold pressed castor oil is easily available and it is best kind of oil to use. These days many brands sell oils which have mineral oil added to reduce the thickness and stickiness of oil. So, it is important to make sure your castor oil is from a reputed brand and is 100% pure. Also it is best if it is organic and cold pressed. Soulflower is a well known brand which deals in essential oils, carrier oils and organic soaps. This brand is easily available online and the oil is cold pressed, pure and natural. This oil from soulflower comes packaged in a plastic bottle with a flip cap making it travel friendly. This oil can be used on both skin and hair. Soulflower infact recommends this oil as a perfect emollients for face and lips. This oil can also be used for cracked heels, nails, brows and lashes making it a multi purpose beauty tonic. The texture of this oil is on the thicker side as it is pure and the scent is barely there making it suitable even for sensitive noses. If you are looking to start of with castor oil for haircare or skin care then it is best to opt for a well known brand like soulflower which is popular for its natural and high quality products. This is one of the best castor oils in India at present. One of the more affordable yet quality options is from the south Indian brand Aloe Veda. The packaging of castor oil from Aloe veda is practical and sturdy, coming in a plastic bottle with flip cap which dispenses small quantities evenly. You can directly apply this oil on hair and skin or mix it with other carrier or essential oils to blend and dilute it before application. I am huge fan of the brand aroma magic and love their eye cream and face scrubs. This castor oil from aroma magic is among the best castor oils in India and is a gem of a product which comes in two sizes one 100 ml and another 200 ml. I suggest you try the smaller version first and see how it suits your hair and skin before investing in the bigger bottle. You can use this oil both on skin and hair and it is very reasonably priced. Packaged in a leak proof plastic bottle this oil from Khadi is cold pressed and can be used on face, lips and hair. You can also use this oil on eye lashes, brows and nail cuticles to strengthen them. Many women have found this oil very effective in crolling hair fall right from the first use but since it is pure the texture is on the thicker side, so it is better to dilute it with equal amounts of coconut oil before application to scalp. High quality cold pressed castor oil from Nature's absolute is thick, sticky and has a mild scent. This oil is in its purest form and works wonders on hair but make sure to add some drops of essential oil or dilute it carrier oils like coconut or olive oil and leave it overnight. This oil can also be used to hydrate skin in winters. Pure food grade quality castor oil from G drops is solvent free and extracted using cold pressed method. This oil can be used on hair and also on skin to combat acne, scars and stretch marks. This packaging is actually very ideal skin application as it comes in a plasic bottle fitted with a pump dispenser. If you are looking to try castor oil as an effective skin and hair care product then this brand is definitely worth considering. Castor oil from Rey naturals comes in a transparent bottle with a flip cap and is cold pressed to retain maximum nutrients and vitamins during the extraction process. This oil is a great addition to both your hair care and skin care and is easily available online. You can use this oil to prevent hair loos and promote hair growth. If you want to use it on skin then it is best to dilute it a bit with other oils or moisturizers. You can also use it on scars, sunburns and skin infections like ring worm. Packaged in a classy black plastic bottle with a pump dispenser finn naturals organic castor oil sure gives a premium feel. This nutrient rich cold pressed oil is a hair loss remedy, fades strech marks, gives soft skin and lips and also reduces cellulite. Offering multiple benefits this hexane free castor oil by finn naturals can help treat skin and hair problems the natural chemical free way. Another very conveniently packaged castor oil with a dispenser for mess free application on skin and hair. Priced affordably this silicon, sulphate and mineral free castor oil is ideal solution is you are looking to go the chemical free route to your common hair and skin problems. From the trusted house of Dabur this castor oil is also very good option if you are looking for something on a budget. Dabur castor oil is marketed as an ayurvedic medicine which can be consumed by both kids and adults to relieve health conditions like constipation. If it is safe for consumption then it is definitely safe for application on both hair and skin. Now that we are done the list of brands with best castor oil in India lets have a look into castor oil benefits for hair and skin. * As a moisturizer: If you have dry skin using oil for moisturizing is better than applying chemical laden creams. 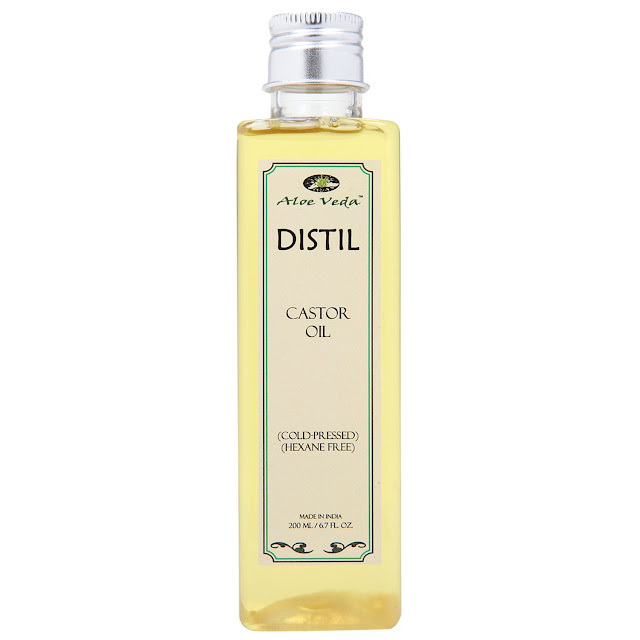 Castor oil is a natural humectant which locks in moisture and soothes your skin making it soft and supple. Just take a few drops of castor oil and add equal amounts of almond oil and massage on face in circular motions. This works best in winter as an inexpensive moisturizer to hydrate dry scaly skin. * Reduces acne: Antibacterial properties of castor oil help fight acne. It also is anti inflammatory helping sooth irritated acne prone skin. * Fights fungal infections: Castor oil also has antifungal properties so it can be used to fight common fungal infections like ring worm and athletes foot. Studies also have shown castor oil to be effective in fighting mouth fungal infection caused by Candida. * As a massage Oil: Castor oil can be used to relieve muscle soreness and improves blood circulation making for a good massage oil. For a soothing spa like massage feel at home add a few drops of peppermint essential oil to castor oil and massage it gently until completely absorbed. * Promotes Hair growth: The most widespread use of castor oil is in hair care. The presence of omega 6 fatty acids help improve blood circulation in scalp helping hair grow faster and making them stronger from the roots. * Natural Hair conditioner: You can use castor oil like a natural hair conditioner but since this oil is very thick it is best to mix it with other oils like almond oil or coconut oil and apply on scalp an hour before having a bath. This pre conditioning treatment for hair works best if you have very dry or damaged hair. * Dandruff Treatment: Castor oil with its emollient and anti inflammatory properties can help treat dandruff. Dandruff is a scalp condition with dry, itchy and flaky skin which can be avoided with regular massage of nourishing castor oil. Since castor oil has a very thick consistency it is best to mix it with other oils before application to hair. using only castor oil on hair can lead them getting weighed downs and becoming too greasy. I recommend mixing equal quantities of castor oil and coconut oil with a few drops of rosmary essential oil for a nourishing hair oil mix which smells amazing . With coconut oil I always apply it in night and wash off in the morning but since castor oil is cooling properties it tends to give me a runny nose so I apply it only 2 hours before shampooing. How Often should you use castor oil for Hair growth? Applying castor oil to hair twice a week is enough to help with hair growth. Many women i know also apply this oil one a month and have got the desired results. Applying castor oil daily is fine but not really needed as it can end up making your hair greasy and lead to over shampooing which will in turn harm your scalp more. Always do a patch test to check for allergies on your inner arm before applying any new oil. When buying castor oil look for words like organic, pure and cold pressed on the label. Castor oil is known to help induce labour so it is not safe for consumption during pregnancy. Castor oil is very thick can be very difficult to wash off from hair. It is best to mix castor oil with other oils like almond or coconut oil before application to hair. With natural treatments and ingredients results are never instant. So please be patient and results will follow although many women see reduction in hair fall after just 3 applications of castor oil. Now that you know about the benefits of castor oil and the best castor oil in India are you ready to include castor oil in your hair and skincare routine?